What do Aussie TV icons Tony Barber, Daryl Somers, Sandy Scott, Rob Brough, John Deeks and Bert Newton have in common with diminutive former morning television weatherman Grant Denyer? Aside from just being on the tele, they’ve all hosted one of my favourite old-school TV gameshow formats, Family Feud. 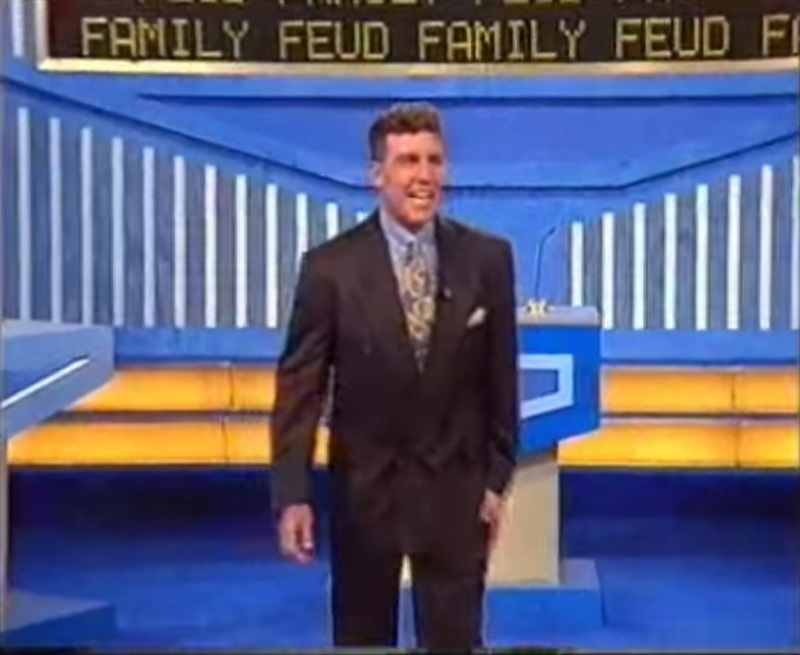 Family Feud was a product of the Goodson Todman gameshow empire, from whence also emanated the likes of Blankety Blanks, Now You See It, Double Dare and The Price Is Right. 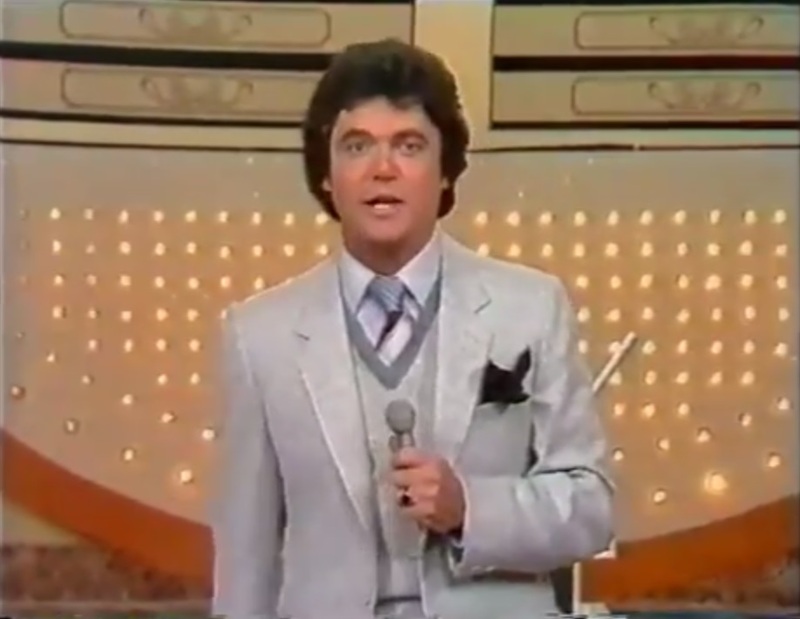 It first aired in the US in June 1976 and over the ensuing 38 years it’s only been out of production for six non-consecutive periods, having racked up more than 8,000 episodes over 32 seasons. Here in Australia it’s history hasn’t been quite as long and glorious, though it’s now into its twentieth non-consecutive season, having aired on all three commercial networks. 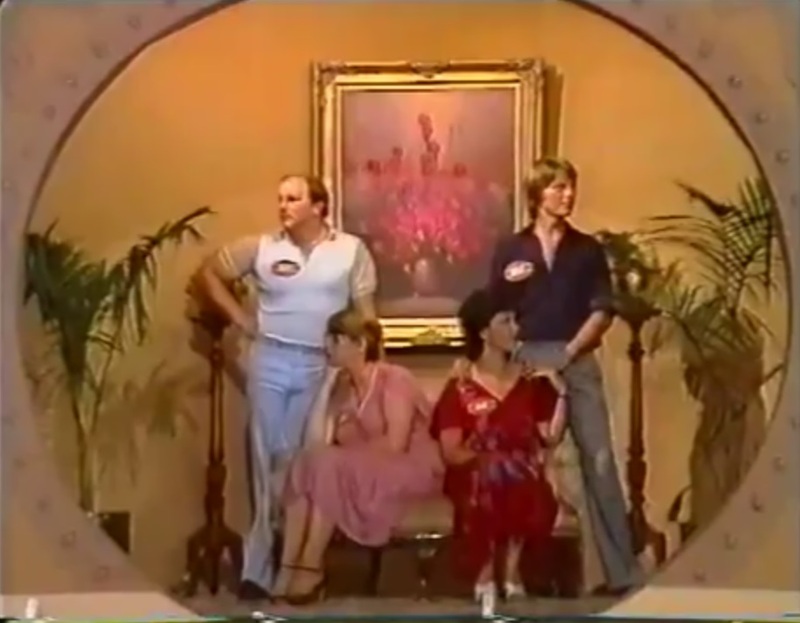 The local origins of Family Feud were quite unique too, being produced out of Perth and airing in WA, South Australia and Queensland in 1977, before premiering in Sydney and Melbourne in 1978. Despite a very short-lived revival with Australian TV royalty Bert Newton at the helm in the mid-2000s, Network Ten somehow believed the time was right in 2014 for yet another revival. 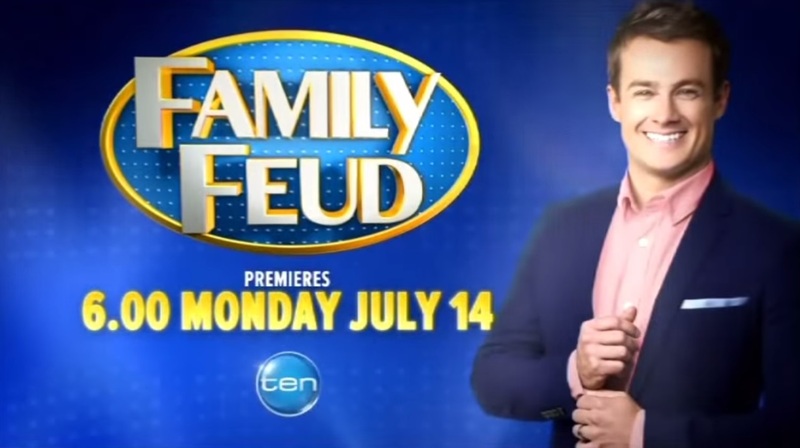 “Australia wants Family Feud back on its TV screens”, their research apparently told them, in that nationally inclusive way that only 21st century research can; it’s unclear if they surveyed more than 100 people to come up with that answer. Either way, there’s no doubt the revival has been a ratings success for the recently ailing network, but watching it regularly has raised a few questions. First and foremost are the top answers to the questions they apparently survey 100 people for. I seem to recall having far more “oh yeah…” moments when each round’s missing answers were revealed on the show’s 70s, 80s and 90s incarnations, but with this new series those moments are more “WTF” than “a-ha”. Example: last week Denyer asked contestant Amanda to name something it’s hard to go without for a whole day; her response was ‘sleep’. “Good answer”, said I with an enthusiastic nod of approval in the direction of the TV screen. But the much-loved (and oft-copied) ‘bow-bow’ sound, along with the big red cross filling the screen, confirmed that of the 100 people surveyed ‘sleep’ wasn’t among their top six answers, leaving Amanda to (quite rightly) question out aloud, “who are these people?”. In the spirit of the modern age, mother Vesna then suggested ‘social media’ might be hard for some to go without for a whole day – again, no deal. Sister Tanya didn’t hesitate to put ‘coffee’ forward and even Denyer thought it was a great answer. 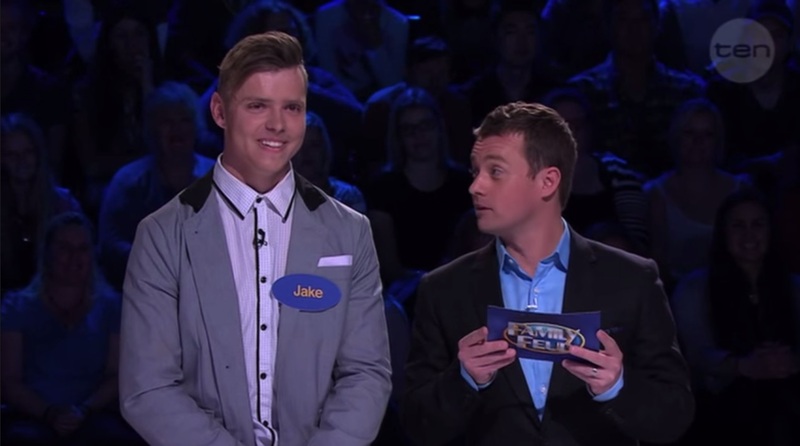 “But does Australia agree?”, the pint-sized host asked before throwing to the board: again, a seemingly obvious response wasn’t among the top 6 answers from the 100 people who were asked the same question. It’s lucky the sample size is so small, coz if these really were statistically significant results the top four responses to this particular question would tell a pretty scary story about the Australian population; based on these responses, the majority of Australians believe it would be harder to go a whole day without your ‘phone’ than ‘eating’ or ‘drinking’ and nearly a quarter of the population believes it would be hard to go without ‘breathing’ for a whole day. That’s right, as if to prove how dumb the general public can be, 20% of our one hundred respondents (yep, that’s five people) said it would be hard to go without breathing for a whole day. Hard – not impossible, just hard. The fact that not breathing would sort of leave you a little bit dead before even half a day was out, let alone a whole day, apparently doesn’t matter. It’s hardly surprising, though. They survey 100 people – that’s roughly 0.0004% of the entire Australian population, so aside from being the very definition of “statistically insignificant”, it’s rather a long way from being what “Australia agrees”. I also have a sneaking suspicion that the 100 people surveyed by the Melbourne-based production are all, in fact, Melbournians who are all, in fact, surveyed right there in Melbourne. Case in point – a recent question from the ‘fast-money’ segment: name an Australian city starting with B. Now if it was a truly national survey, it’s reasonable to assume the top answer might have been Brisbane and the second most popular answer might’ve been any number of relatively well-known B cities from around the country – Bathurst, Broken Hill, Bundaberg, Burnie, Bunbury, Busselton – but no. Being a Melbourne production and, presumably, a Melbourne survey the top answers were Bendigo and Ballarat. Our champion family that night weren’t Victorians and so, unsurprisingly, didn’t get many points for that one. It’s the perpetual challenge of all national programs involving the general public: how to make a show that appeals to anyone in any part of the country, without allowing local participants’ narrow ‘own backyard’ viewpoints to skew the focus… or the results. The other thing I’ve noticed with some of the results is either vague questioning and specific top responses, or specific questioning and vague top responses, or an even more frustrating combination of the two – most common: the vague question / vague + specific top responses combo. Another fine example from last week: name someone a young child might admire. The families came up with eleven answers in total and somehow fathomed six of the eight top responses, a bizarre collection of specific and non-specific people, both real and fictional: parents, sports star, popstar/actor, grandparent, superhero, The Wiggles, teacher and Santa. Such an inconsistent assortment of answers surely only makes winning all the more difficult for any family. Or maybe that’s entirely the point? It is a family feud after all – and since when were they ever logical or rational? ← So Ian Thorpe’s gay, is he?